Looking for older news posts? Be sure to visit our News archive! 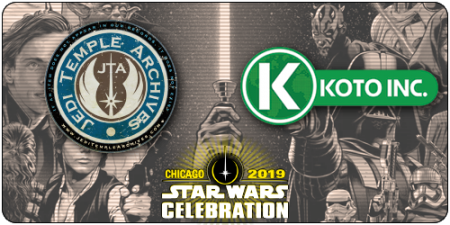 It’s day 4 at Celebration Chicago and we are still going strong! Check out some of the amazing costumes, panels, and fun from today’s Celebration experience! Well, I am not sure if Tom Kane is going to have a job after this. During an interview at Star Wars Celebration, he stated that for the last six years he’s voiced Admiral Ackbar. And he immediately explained his disdain for his character’s death in The Last Jedi. He said (paraphrased) “And I was not really thrilled how they blew him up outside of the ship. And I’m like who’s this Holdo woman? And nobody knows this. No one invested in this. Who is she? Why is she saving the fleet?” before the host interrupted him to change topics and looked nervously doing so. The host’s expression is classic. See the clip yourself before it gets edited out at the 3 hours 49-minutes mark of the live feed on YouTube. The Clone Wars Season 7 Discussion! Discuss The Clone Wars Season 7 RIGHT HERE! Man oh man is this going to be a great “reboot” (I know it’s NOT a reboot) of the series! A First Look At The Mandalorian! The Mandalorian panel just closed a few minutes ago. Jon Favreau and Dave Filoni talked about the show and revealed a few details. Also on the panel were the three main characters Pedro Pascal, Gina Carano and Carl Weathers. And while not very much was revealed, almost nothing about the actual story, we did learn a few things! A sizzle reel was also shown, however, the YouTube stream faded to back when the footage was shown. But several Bothan spies were able to smuggle out the footage and we will show you some screenshots of the revealed footage! So click through for a look at The Mandalorian! GameStop has the exclusive The Black Series [Phase III] Shock Trooper helmet for 50% off. Special thanks to JTA reader Vincent B. for the alert. The Original Trilogy Collection Darth Vader’s TIE Fighter was the first release of this vehicle since 1997’s The Power Of The Force “2” release (and also a Toys R Us exclusive). It comes with a Darth Vader pack-in figure too. Learn more in our Research Droids Reviews today! Be sure to leave your thoughts in our comments section, vote in the poll or comment about it on our Facebook page. Click the banner below for the direct link to the review! As always, you can also send your review requests via email if you’d like to see something that we didn’t cover yet. 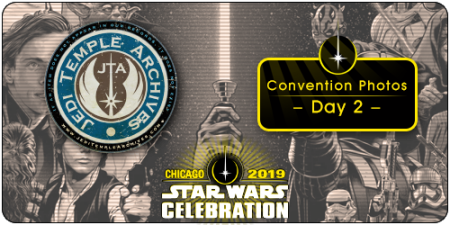 Here’s a look at some of the fun costumes and activities from day 3 of Celebration Chicago! Respawn Entertainment (developer of Titanfall, owned by EA) finally revealed a trailer for the upcoming Star Wars Game Jedi: Fallen Order, in which you play an Order 66 survivor, a young male Padawan named Cal Kestis, who tries to blend in. Barriss Offee is supposed to be featured in the game as well. It was already revealed yesterday that the game will be single player only and that there won’t be any microtransactions. So fans of story based games may finally get something from EA. The game has a release date of November 15th. There’s one thing however which raises eyebrows. Respawn merely released a story trailer, no actual gameplay footage was shown. Mere seven months before release you would think they have at least something to show. That they didn’t present any gameplay at all should make fans somewhat wary. Maybe the game will once more be developed in typical EA fashion: big crunch time towards the end where the devs will code 24/7, six months straight, with the game still not really finished on release date and needing several patches post release. Let’s hope the game will actually be finished and more or less bug-free when it is released in November! Hasbro has released official PRESS IMAGES and we have them in a gallery on our Facebook page. Check them out! Since Diamond Select Toys is the new Gentle Giant, they featured all the latest mini busts and statues from Gentle Giant. Click through to check out our full gallery of the Diamond Select Toys booth! Pre-order the Amazon exclusive The Black Series [Phase III] 6″ Emperor Palpatine with throne room chair! Day 2 is a wrap! Click through for our full gallery of costuming and festivities from around the convention! 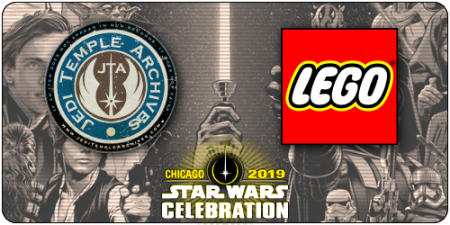 LEGO is celebrating 20 years with Star Wars, and their booth was fully themed for the event, including a brilliant display with a LEGO luck Skywalker coming ‘off the page’. You can check out our full LEGO gallery right here! 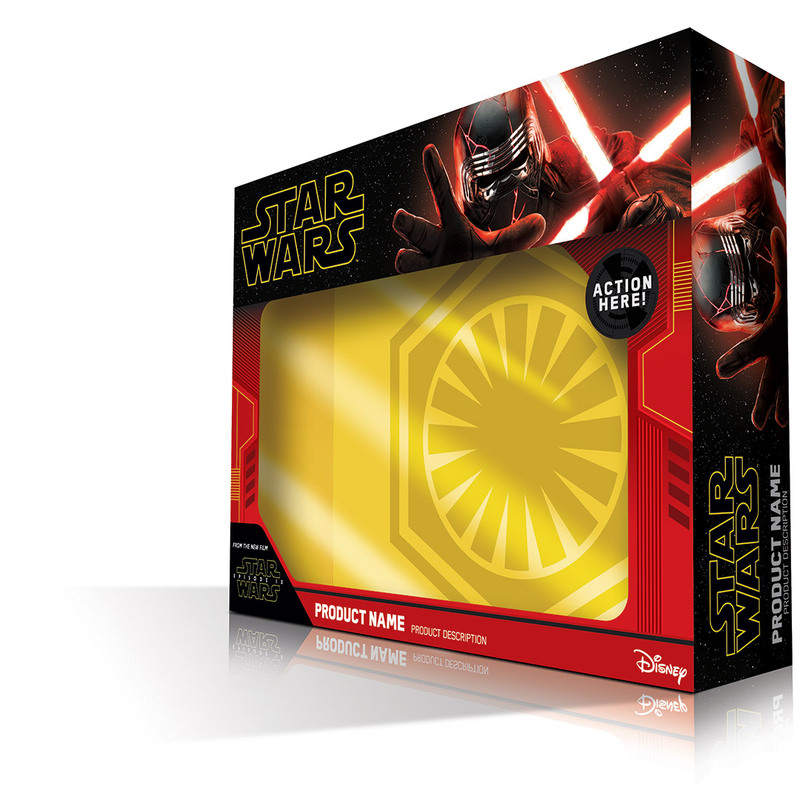 Affiliate and sponsor Entertainment Earth has placed the new merchandise up for order. Click through to see what’s available! 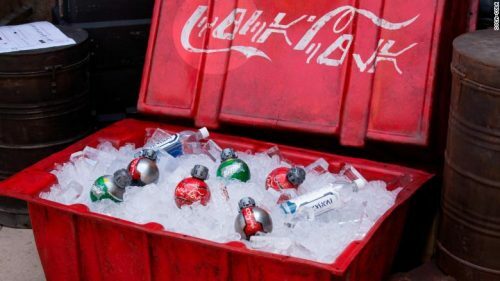 Also revealed earlier today on the Star Wars Show Live (around the 5 hour 4 minute mark) was the following: Star Wars Jedi: Fallen Order will have NO microtransactions and NO multiplayer, it will strictly be a story focused single player game. The statement was made by Vince Zampalla, head of Respawn Entertainment, who develop the game. I suppose this news is something that should elate all gamers who have been asking for something like that for years now. Maybe EA have learned their lesson not just with Battlefront II, but also with missteps like Anthem. More details about Fallen Order will be revealed on Saturday, so stay tuned! But this news alone makes me a lot more excited for it. Now that’s a very interesting tidbit which was revealed following the Episode IX panel at SWCC earlier today. 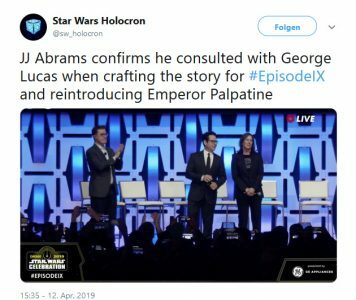 JJ Abrams actually consulted with George Lucas for Episode IX and the return of Emperor Palpatine! Does it mean that some of George’s ideas made it into Episode IX? Or was JJ merely asking for some insight into the character of Palpatine? Either way it’s good to see that George’s input is still valuable, no matter how minor (the wardrobe scene in Solo) or major (Palpatine’s return) it may be. JJ certainly knows that the franchise owes everything to George Lucas and for him to have some input on the very last Skywalker movie is only appropriate, I think. Well, this is interesting. JTA reader bnicks87 sent me an image PROVING that the re-released TVC Darth Vader (VC08) figure has a running change. Our sample featured a two-piece removable helmet (dome/faceplate and collar), but bnicks87’s sample came with the original three-piece helmet. It looks as if only the earliest examples have the “Evolutions” helmet. Dang, it. I shouldn’t have opened mine. During the Q&A at the Hasbro Presentation, the dreadful issue of the incorrectly designed “name pill” came up (and is something we’ve been complaining about since TVC’s return). While they were unable to answer definitely, Hasbro did concede that they’re looking into it. Hopefully, like other issues in the line, this also gets corrected as well. (Special thanks to JTA reader and friend Binary_Son for the graphic below and for helping to keep this a burning issue for super-articulated collectors. 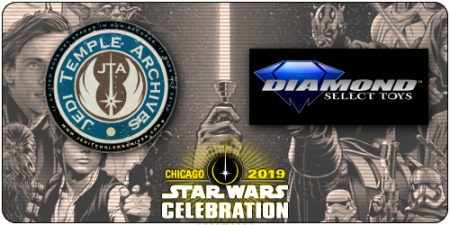 Celebration Chicago: Hasbro Booth Updated With New Reveals Gallery! Here is the gallery of the Hasbro showroom floor revealing all of the new stuff from the Presentation. Check it out on our Facebook page! The New Episode IX Toy Box Art! 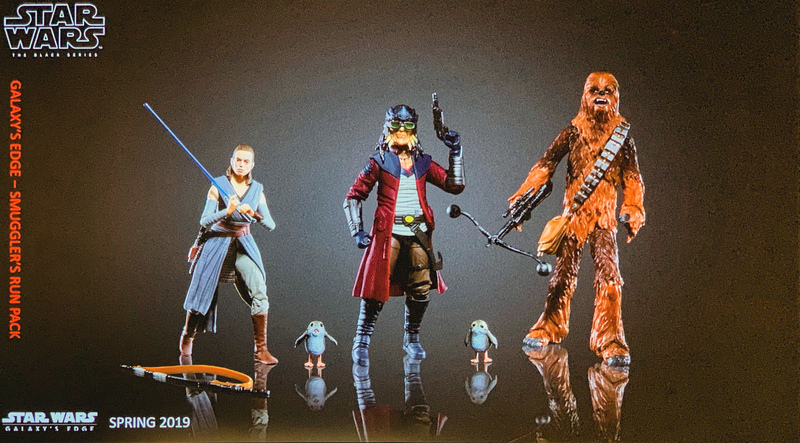 Earlier today the box art design for Episode IX toys was also revealed. Expect quite a few of these boxes come October! 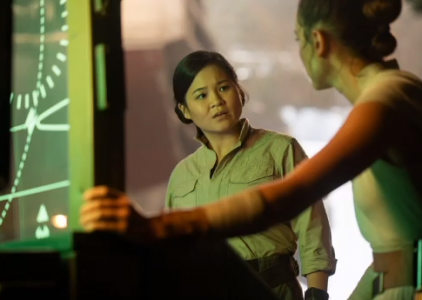 It’s interesting that Kylo is the focus here and not Rey, for TLJ we had several characters on the box. As we revealed yesterday, the three figures that make up the Skiff Guards three-pack will come individually carded. Look at how beautiful these carded figures are. More, please, Hasbro. Be sure to visit our News archive for older news posts! Visit Jedi Temple Archives's profile on Pinterest.